Definition at line 12 of file CREMapInformation.h. Definition at line 3 of file CREMapInformation.cpp. References myExperience, myLevel, myShopGreed, myShopMax, and myShopMin. Definition at line 12 of file CREMapInformation.cpp. References myExperience, myLevel, myPath, myShopGreed, myShopMax, myShopMin, and path(). Definition at line 107 of file CREMapInformation.cpp. Referenced by copy(), CREMapPanel::setItem(), and CREMapInformationManager::storeCache(). Definition at line 112 of file CREMapInformation.cpp. References level(), myAccessedFrom, and myLevel. Referenced by CREMapInformationManager::loadCache(), and CREMapInformationManager::process(). Definition at line 80 of file CREMapInformation.cpp. Referenced by CREMapInformationManager::checkInventory(), CREMapInformationManager::loadCache(), and CREMapInformationManager::process(). Definition at line 101 of file CREMapInformation.cpp. Definition at line 152 of file CREMapInformation.cpp. Definition at line 163 of file CREMapInformation.cpp. Definition at line 224 of file CREMapInformation.cpp. Definition at line 75 of file CREMapInformation.cpp. Referenced by copy(), and CREMapInformationManager::storeCache(). Definition at line 22 of file CREMapInformation.cpp. Definition at line 29 of file CREMapInformation.cpp. References accessedFrom(), archetypes(), exitsTo(), experience, level, mapTime(), myAccessedFrom, myArchetypes, myExitsTo, myShopGreed, myShopItems, myShopMax, myShopMin, myShopRace, name, path, region(), setExperience(), setLevel(), setMapTime(), setName(), setPath(), setRegion(), shopGreed(), shopItems(), shopMax(), shopMin(), and shopRace(). Definition at line 48 of file CREMapInformation.cpp. References myName, myPath, and path(). Referenced by CRERandomMapPanel::setItem(), sortMapInformation(), and sortRandomMap(). Definition at line 96 of file CREMapInformation.cpp. Referenced by copy(), CREMapInformationManager::process(), CREMapPanel::setItem(), and CREMapInformationManager::storeCache(). Referenced by setExperience(), and setLevel(). Referenced by addAccessedFrom(), and setLevel(). Definition at line 86 of file CREMapInformation.cpp. Referenced by copy(), CREMapInformationManager::process(), and CREMapInformationManager::storeCache(). Definition at line 147 of file CREMapInformation.cpp. Referenced by setName(), and setPath(). Referenced by CREMapInformation(), displayName(), and setPath(). Definition at line 158 of file CREMapInformation.cpp. Definition at line 219 of file CREMapInformation.cpp. Referenced by CREMapInformationManager::randomMaps(), and CREMapInformationManager::storeCache(). Definition at line 138 of file CREMapInformation.cpp. Referenced by copy(), CREMapInformationManager::getMapsForRegion(), setRegion(), and CREMapInformationManager::storeCache(). Definition at line 133 of file CREMapInformation.cpp. Referenced by copy(), CREMapInformationManager::loadCache(), and CREMapInformationManager::process(). Definition at line 123 of file CREMapInformation.cpp. References experience(), level(), myExperience, and myLevel. Definition at line 91 of file CREMapInformation.cpp. Definition at line 70 of file CREMapInformation.cpp. Definition at line 60 of file CREMapInformation.cpp. References myName, myPath, name(), and path(). Referenced by copy(), and CREMapInformationManager::loadCache(). Definition at line 142 of file CREMapInformation.cpp. Definition at line 184 of file CREMapInformation.cpp. Definition at line 214 of file CREMapInformation.cpp. Definition at line 204 of file CREMapInformation.cpp. Definition at line 194 of file CREMapInformation.cpp. Definition at line 179 of file CREMapInformation.cpp. Referenced by buildShopReport(), copy(), and CREMapInformationManager::storeCache(). Definition at line 169 of file CREMapInformation.cpp. Referenced by buildShopReport(), copy(), CREMapInformationManager::loadCache(), CREMainWindow::onReportShops(), CREMapInformationManager::process(), and CREMapInformationManager::storeCache(). Definition at line 174 of file CREMapInformation.cpp. Definition at line 209 of file CREMapInformation.cpp. Definition at line 199 of file CREMapInformation.cpp. Definition at line 189 of file CREMapInformation.cpp. Definition at line 83 of file CREMapInformation.h. Referenced by accessedFrom(), addAccessedFrom(), and copy(). Definition at line 80 of file CREMapInformation.h. Referenced by addArchetype(), archetypes(), and copy(). Definition at line 82 of file CREMapInformation.h. Referenced by addExitTo(), copy(), and exitsTo(). Definition at line 85 of file CREMapInformation.h. Referenced by CREMapInformation(), setExperience(), and setLevel(). Definition at line 84 of file CREMapInformation.h. 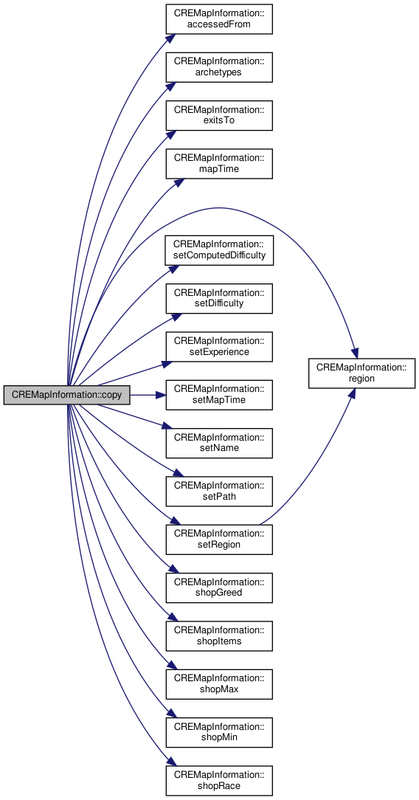 Referenced by addAccessedFrom(), CREMapInformation(), and setLevel(). Definition at line 81 of file CREMapInformation.h. Referenced by mapTime(), and setMapTime(). Definition at line 87 of file CREMapInformation.h. Referenced by addMessage(), and messages(). Definition at line 79 of file CREMapInformation.h. Referenced by displayName(), setName(), and setPath(). Definition at line 78 of file CREMapInformation.h. Definition at line 88 of file CREMapInformation.h. Referenced by addQuest(), and quests(). Definition at line 93 of file CREMapInformation.h. Referenced by addRandomMap(), and randomMaps(). Definition at line 86 of file CREMapInformation.h. Referenced by region(), and setRegion(). Definition at line 90 of file CREMapInformation.h. Referenced by copy(), CREMapInformation(), setShopGreed(), and shopGreed(). Definition at line 89 of file CREMapInformation.h. Referenced by copy(), and shopItems(). Definition at line 92 of file CREMapInformation.h. Referenced by copy(), CREMapInformation(), setShopMax(), and shopMax(). Referenced by copy(), CREMapInformation(), setShopMin(), and shopMin(). Definition at line 91 of file CREMapInformation.h. Referenced by copy(), setShopRace(), and shopRace(). Definition at line 19 of file CREMapInformation.h. Referenced by copy(), CREResourcesWindow::fillMaps(), and CREMapInformationManager::storeCache(). Definition at line 18 of file CREMapInformation.h. Definition at line 17 of file CREMapInformation.h. 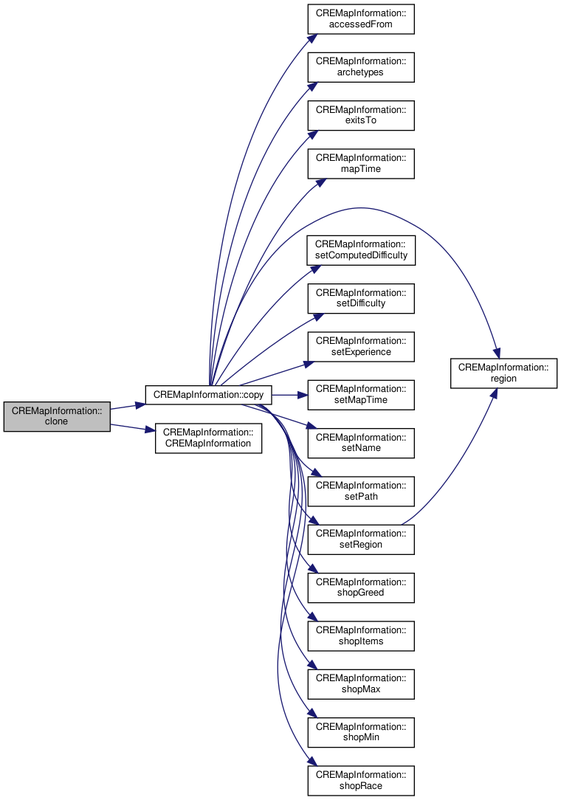 Referenced by buildShopReport(), copy(), CREResourcesWindow::fillRandomMaps(), CREUtils::mapNode(), CREMapInformationManager::process(), CREMapPanel::setItem(), and CREMapInformationManager::storeCache(). Definition at line 16 of file CREMapInformation.h. Referenced by buildShopReport(), CREMapInformationManager::checkEvent(), copy(), CREUtils::mapNode(), CREScriptPanel::setItem(), CREMessagePanel::setItem(), CREQuestPanel::setItem(), and CREMapInformationManager::storeCache().